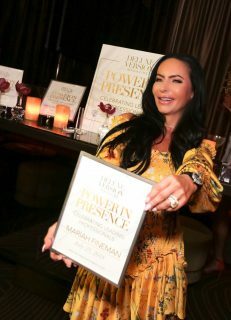 LAS VEGAS — Mariah Fineman was named 2018 “Power In Presence” by Deluxe Version Magazine on July 25th, 2018 held at Clique Lounge inside of The Cosmopolitan of Las Vegas. The Power In Presence event by Deluxe Version is a masterful celebration of recognizing local leaders who are contributing to making Las Vegas a better place though their mantra “Talent. Taste. Fashion. Finer Living. – this is the theme we have come to love, as life is meant to be lived to the fullest. Each feature contributes to living the best version of life you possibly can from pages to your lives and Mariah Fineman embodies each of these elements,” said owner and creative director Tim Hancock. Mariah Fineman, President of greenONE Holdings, the creators of Las Vegas’ born and raised idrink beverages stresses water is not just water, rather it’s what’s inside that counts and idrink beverages is living up to its word in lifting the water market to a new level of taste, feel and hydration through the power of nanotechnology. The luxury publication based on the US west coast honors prestigious individuals monthly in Las Vegas for community leadership, corporate success, and philanthropy. Honorees are chosen from previous honorees and in turn choose candidates for future acknowledgment. This honor is one of the most sought-after awards in the Las Vegas area amongst local business owners, entertainment personalities, and community leaders.